Building and planting your own pallet vegetable garden is easy! Pallets are easy to come by, so select one that’s not broken, and not made of pressure-treated lumber. Pallets are everywhere, so take the time to find one in good condition and that is not made from pressure-treated wood (due to the leaching from potentially harmful chemicals). They come in different shapes and sizes so don’t assume all pallets are the same. Make sure it’s cleaned off and you’ve inspected it for any stray nails or splintered wood. It’s a good idea at this point to wear a sturdy pair of gloves while inspecting and cleaning the pallet. Return the pallet to a flat surface. 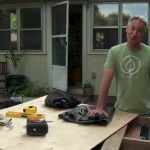 Although you could plant out your pallet with it resting on the ground, placing it on a tabletop or sawhorses makes it easier to work with from a standing position. Place the pallet so that the side with the widest openings is facing up. This will be the backside, which you’ll mount against the wall. Lay out the landscape fabric or cloth to cover the back and bottom and cut to size. Pull tautly and secure with nails or staples. Some pallets have wood covering the bottom of the pallet, which will help prevent soil from falling out the bottom. If not, you may choose to add another piece of wood, like a 2×4. But in either case, make sure the fabric covers the bottom as well as the back to catch any soil that may otherwise fall out. This would also be the time to add a thick layer of plastic or other waterproof barrier. 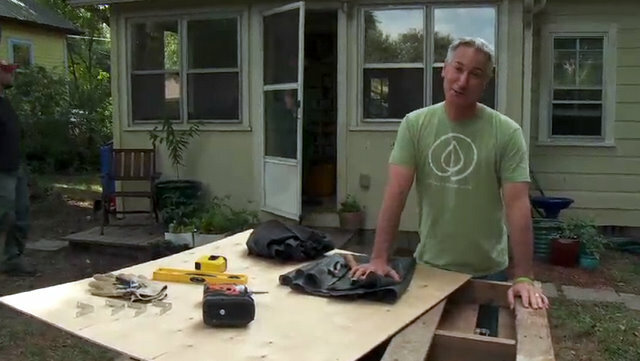 This step wasn’t included in the DIY segment on the episode but this is an important part of protecting the exterior of the house from the moisture and grime of the pallet garden. Next add the thin plywood over the cloth and/or plastic and secure. Now turn the pallet over and fill with good quality potting soil or container mix. Don’t use ordinary garden soil or soil that is designed for planting beds, as it’s too heavy and won’t drain as well. Be sure to add most of your soil before adding the plants. Now, go ahead and tilt the pallet up nearly vertical to allow soil to settle without it spilling out between the cracks. Then continue to add soil until the pallet is full. Next add the plants. Don’t be afraid to pack them in. Position the plants so their root balls are securely placed between the slats and tuck them in firmly. Once you have all your plants in position, add additional soil if needed but be sure to reserve some to add once the pallet is mounted. Don’t water yet due to the added weight. Use good quality soil, and really pack it in! Now it’s time to mount the pallet. Get two helpers and position the pallet between the brackets already secured to the house. It’s helpful to have something to rest the pallet on while it is being secured to the wall. With helpers holding the pallet in place, the third person can attach the brackets to the pallet. Finally, make sure all the plants are positioned firmly in place and that the roots are in good contact with the surrounding soil. This is also the time to add the reserve soil to fill those voids. Thoroughly water the plants and soil. Again, you’ll have more settling and some soil loss here so have some extra soil on hand and add as necessary. Get some help securing the final product, and water it well! Over the next few days, continue to monitor the garden and add soil and water as needed as the plants establish and soil continues to settle. Once the roots fill out in a couple weeks, then just make sure to keep it watered. Because this garden is above ground, it will dry out more quickly. Like other containers, daily watering is likely. Watch the full episode this project came from, Episode 221: Living Walls. Burpee Home Gardens modified vertical pallet garden with feet! Special thanks to our friend Fern Richardson at Life on the Balcony, for her Pallet Garden plans. 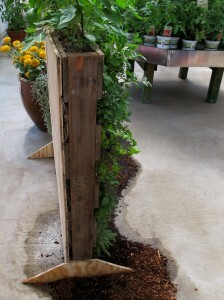 Update: 4/3/12: Last week while touring the floriculture Pack Trials in California, I saw a modification of our pallet garden: Burpee Home Gardens added simple feet using triangular pieces of plywood. Just wanted to know, is a good idea to grow the pallet garden laying flat on the ground instead of vertically mounted. I don’t have an area to mount it. 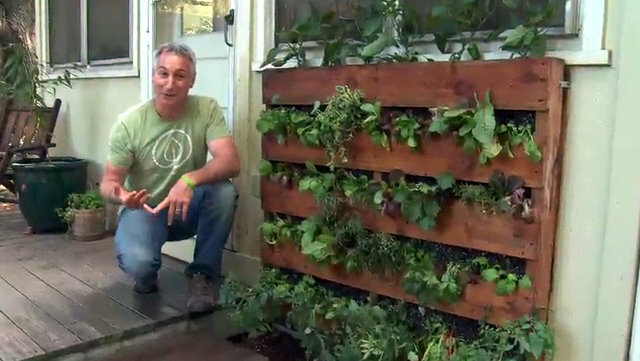 Tim, If you don’t have a wall to mount a pallet garden on you may want to consider raised beds for your plants. The other thought would be constructing some type of frame that stands upright to support the pallet garden. But remember one of the advantages to the pallet garden is the way it drains well and plants can cascade. Best of luck with all your garden projects. I started this project last night with my girlfriend and we used tarp on the backside of the pallet but no plywood. When we started packing in the plants and the soil, we thought we were set – but upon lifting, the soil began to weigh on the back and everything started shifting/falling apart! Do you think if I carefully slide some plywood under the backside of the pallet and lift it carefully to secure, this will stop the soil from weighing on the back? Any tips here are greatly appreciated – GREAT DIY, by the way! Hi Matt. Hmmm. If possible, yes, I would see if you can provide a firm backing to hold the soil in place. Tough to do after the fact but I’d say it needs to be either that or pull the plants, lay the pallet face down with the back facing up and add the plywood backing. Then replant. But the back side is so much more exposed than the front, you don’t want the side of your house acting as the barrier for all that wet soil. Good luck! Great tutorial! Do you know if Tomatoes might work ? I am reconsidering planting inside my pallet and instead hanging pots or some other containers onto the pallet for the vertical base. Water leakage and soil movement sounds like a mess. I love the idea, though, of the pallet as the backdrop. Do you have any suggestions for pots to hang on the outside of the pallet? I have seen people using shoe organizers, but would there be a concern for chemical seepage into the veggies? Is there a type of pot you would recommend? I have also seen gutters attached. What is your opionion on that? I do like the gutter garden options that you refer to. You can find a lot about that by googling that term. Also, for plantable pockets, kind of like the shoe organizer you mention, check out “wolly pockets”. They’re a product designed for just what it sounds like you are wanting. As for chemical cross-contamination, this is possible so you’d just have to make sure any seep or drip from fertilizer or chemicals you put on your non-edibles doesn’t drip into the edibles if that’s a concern. Are there bottoms on each row of plants (either wood or landscape fabric) creating pockets, aiding in keeping dirt from falling out? Is there a recommended width between the slates which plants will be planted? Yes, the fabric or wooden bottoms do help hold the soil in. As roots become more established, the less soil you’ll see fall through. But fabric or something to act as a barrier is best to hold in what’s there. I don’t know of any suggested spacing between slats. But most pallets come with a side that has wider spacing than the other. That should always be the back side. On the front, you could add extra slats if you want to reduce the spacing even more. All you really need is enough room to get your plants situated when you start. After that, any extra room is really unnecessary. On the other hand, I don’t know many people that go to the trouble to narrow the spacing between rows on the front side. Once the plant fills out and the roots settle in, you should be fine Kris. I started palate growing with strawberries, basil, lettuce, peppers. My problem that I have is the top to the bottom I have some separation of soil it’s been 2 months now plants are growing good but now I have separation on some of my sections. Should I add more soil to those places that have soil separating? Yes Tracey. It would be a great idea to come back and tuck in soil where there are gaps. Hopefully roots will grow to fill in this space and help hold that soil there as well. My gut feeling is they’re not the best choice. They tend to get to big and busy for pallets. But I always say nothing ventured, nothing gained. So in gardening especially, all bets are off. I hope you give it a try and see for yourself. Even if it doesn’t work out, the cost was minimal and you learned a lot in the process. 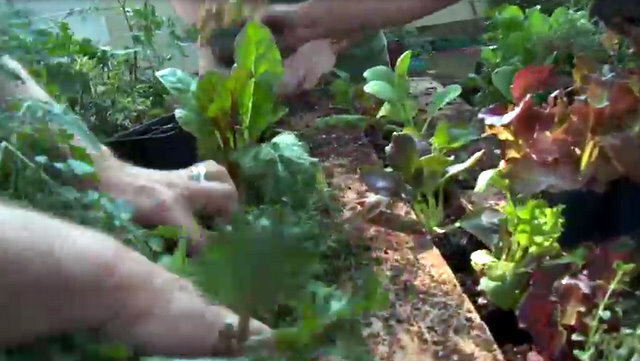 The best way to learn in gardening is simply to try out your ideas and observe the results. Let us know if you do end up using mums. Dear all, does anyone have issues with dirt falling out of the pallet every time it rains or when you water it? Mine causes so much spillage, I have sadly abandoned the project. Suggestions welcome! Hi Cassie. 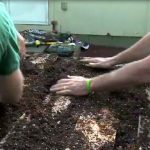 If you re-attempt this project, leave it flat for a week or so after planting so the roots can expand and then start easing the pallet up a bit more each day so that it settles into place better. As the plants fill out and the roots too, the soil will become more stable within the pallet and within 10 days or so, you can have it totally upright and should see much less spillage. I realize that may be way longer than you want to wait to showcase your pallet but if the soil issue is important to you, this should help a lot. I hope others chime in here as well. I plan on putting landscape fabric on the back and on the front and cutting slits for the plants. 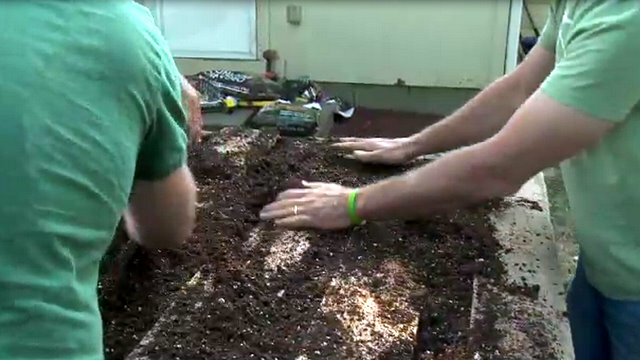 Use the landscape fabric in each level to help keep the soil in. It let’s excess water flow out, but keeps most of the soil in. My question is, how do you water a vertical pallet garden so that all the plants receive enough water? If you water from the front, the water runs back out and doesn’t soak in, so the plants don’t get enough water and start to wilt. It seems that watering from the top will make the top rows really wet, but does the water get down to the lower levels? Watering from the top if the soil is consistent will make it’s way down to the bottom if you soak it. And watering from the front should actually work too. Water can move horizontally in soil too. This may be overkill for you but ideally, drip irrigation hosing through each row would be ideal. If not this time, for next time. That way you get even watering for each row. Reminder to self: Do a blog post or video on how to evenly irrigate a pallet garden. Hi Lori. Installing a drip line can’t hurt but now may be more trouble than it’s worth. If you were adding that before planting, for sure, but still, watering from the top should eventually trickle to the lowest plants. Observation is key and it may be that you may need to get a nozzle attachment for your hose or even a large turkey baster and use that to direct a squirt of water to the lowest plants if you need to give them extra water and you don’t have a hose access where the pallets are located. How can I make sure that the wall is not going to get durty? How can I build a drain system so when I water The plants The water does not fall out? You know it is a very heavy structure, to hang it On The wall it is enough with only 2 L’s as it is shown On The video?!? Ah!!!! If The top of The planter is The only open part, when you water The plants from The top, The ones below will get some water?!? Maybe this are some silly questions, but it’s my first time making this kind of project so I’m a bit scare that it wont work out…. Hi Anina. You’re the first to write saying you want to use this indoors. I agree this will be heavy and messy without some extra care. There are many considerations that must be taken to make this work indoors for a number of reasons. Since I’ve never tried it, I can’t speak from firsthand experience though. I’m posting this in hopes others will share their ideas and wisdom with you. Good luck. Thanks Joe! I hope someone could help me to figure this out! Hi Joe, i think i messed up a bit. I have sealed the back of my pellet with a water proof plastic material, the same used to cultivate trees in. I have stuffed this bugger with potting soil and even stood on it at one stage, then i planted new seedlings. It came out great and i left it over night well watered. The next day i picked it up to stand upright and what happened next would best be described as a land slide ! 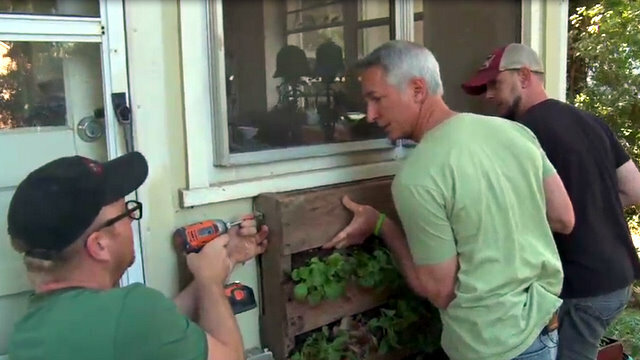 How do you get the soil to stay intact and not just fall out the front ? The plants were all in still but the bottom ones were covered with soil. I lowered it back down and fixed the soil and plants, applied more potting soil and some water and pressure to ” compact ” it as such. I will leave it flat for a week and try to pick it up once again. My front openings are all 4 inches at the most. Yours look about the same ……… I do have some photos i can send now as well. Hey Johnny. You figured out the best thing to do is allow time to give the roots a chance to spread out and fill in the space to stabilize the soil. Sorry I didn’t see your note before now but once the roots fill in a bit, you should be able to mount it vertically with little soil loss. You may also want to start propping up the pallet a bit more every couple days–sort of ease into the vertical position over another week or so. Good luck. I have a question. I have started some green beans, squash, bell peppers, and cucumbers inside my home and they have started to sprout. I know that I don’t need to permanently plant these yet, as they need to root. Would a vertical pallet work for these? I love the idea and it would be great for the space I would like to put it. But would these veggies do ok in a vertical pallet garden? If not, what do you suggest? I do not want to put them in the ground, as I am renting the home I am in and don’t want to leave anything permanent should I decide to move. Any suggestions would be great, as I am just learning how to garden! Hey Shannon. The green beans (if they’re not pole beans) and peppers will do fine in the pallet. The squash will get too big. And don’t worry about planting any of these in the ground. They are annuals and will not survive more than a season — unless you live in a warm area and it doesn’t get cold enough to kill them. If so, plant them in containers in full sun and you’ll be fine. This is literally the best guide online to pallet gardening. I’ve seen a couple of people trying it(it revolves my occupation) and you’ve actually covered the most common mistakes I’ve witnessed “This would also be the time to add a thick layer of plastic or other waterproof barrier.” like this one. I’ve seen pallet gardens destroyed of rain … and incompetence. Very well written and thorough, I like it, that comes from a profi gardener(as you)! Hey I’m planning on planting herbs in my pallet planter. Can you give me some advice on what order (top to bottom) to plant my herb and what to plant together. I know that some herbs need more water than others. And how many herb plants should it get? Thanks for the help. Hey Liz. Tall herbs like rosemary, basil, and dill should be planted on top. But rosemary gets so big and bushy, you might not want to add this. It will takeover that area. I like basil for the top. As for water, I think that’s too hard to fine tune in a pallet since the taller, water loving herbs need to go at the top. It all trickles down. Quantity wise, I like to pack them in so they look really great in the pallet, plus it holds in the soil better. However, herbs grow fast. If you give it good sunlight and sufficient water and fertilizer, they’ll fill in quickly too. Thanks for your response. Would it be better to plant herbs in containers? If so, what herbs can I plant together? I love this idea. My husband and I just moved from our home, with a garden spot, to a small lot. I have worked with animal rescue for many years, thus have a lot of dogs. My fence is not private. I was thinking this would be a great thing to add to the outside of the fence. Gives me a garden and a privacy fence at the same time. Does this sound feasible? I don’t know how much upkeep you have time for Julia but filling a fence line with pallets will require a lot of soil and plants. Also, these plants are annuals (veggies at least) and will die out after the season. So lots of upkeep to keep it looking good. And when it’s not planted or growing, it’s bare. Also keep in mind, pallets are at best, only 4′ tall. So not high enough to be considered really private in my opinion. Not trying to talk you out of trying. Just wanted to give you things to consider. Drainage issue: Get a wide piece of plastic PVC pipe, the appropriate length and cut it in half. use part of the piece removed to create stand or supports for the pipe, place the half open pipe below the pallet and it will catch the run-off. Problem solved. I dont quit understand can you post a picture of this by any chance? Thanks for this post! I’ve been researching how best to make a pallet garden and your information has been most helpful. I’m wondering if there is a recommended spacing for doing this? The pallet I have has spacing of about 1″ – 1 1/2″. Is this too little space? I’m planning on planting spinach, lettuces, strawberries and possibly some herbs. The spinach and lettuce I wanted to plant from seeds. Thanks for your help! Hi Krys and you’re welcome. I do think those slats are on the narrow side, at least for plants you’re not growing from seed. However, planting seeds works in your favor for spinach and lettuce (or whatever). I assume you are planting it with the pallet flat on the ground until they all germinate and the roots help hold the soil in place. The challenge with the spacing between slats that narrow are in planting existing seedlings. That spacing makes it really hard to insert them into the soil. But, if you can, that’s 90% of the problem. As long as the foliage can get out beyond the slats, the roots will have plenty of room behind them to grow. Joe – I’m interested in trying this out on my balcony at my apartment. Only issue I can see is that I’m on the 2nd floor with someone below me…How does/will it drain and release below me? Any suggestions for creating this in a tight location on a balcony? I have many pallets to choose out of and can pick a small one but want to do this right. Any advice would be great…I’m thinking of doing it but I may not be in the right location….maybe I should create a different version ? Devin, it looks like your main issue is the drainage running onto your neighbor’s deck. The bottom line is you have to provide a way for the water to drain from your pallet without dripping onto your neighbor. This is where you have to get creative. Find a way to channel the water in the bottom of your pallet and divert it to a drainage hose that allows the water to flow safely away if that’s possible. While I’ve never been faced with having to do this myself, that’s what I would do. It may be more trouble than it’s worth though. You can easily find traditional round containers, and even rectangular ones that will include a liner or some way to easily capture the drainage. Hi Joe. I am in South Africa and with the wonderful weather we have here gardening is a pleasure. I live on the premises where i work and the gardens are lush. Most of the premises free grounds is a parking lot. We supply, service and repair dental equipment so it is a fairly fancy property. I would like to do a pallet, maybe more, in a wide passage at the back of my flatlet. Regarding drainage, what if you don’t plant anything in the bottom bed/slot and allow the extra water to dry out in its own time ? Surely the plants above the last slot can not drown since the water will drain from the front out the bottom bed ? That is the one thing i will do. What vegies can i plant in an upright pallet ? Thank you far a very interesting and informative site, keep it up ! Hi John. I think your idea is fine. But I’ve also not experienced any flood or excess moisture accumulating at the bottom of the pallet if there is any way for the water to drain. But your way is certainly safe. I just hate to waste that extra space. Plus a full pallet looks so much better. As for what to plant, focus on trailing or vining crops on the lowest level, so they can hang down without limitation or inhibiting other plants above. In the mid sections, I like to plant smaller, bushier plants. Herbs are always a good choice. Lettuce, spinach, and other leafy crops work nicely in the mid levels. At the top, I plant patio, or dwarf tomatoes, and peppers. Those need the height and space and they’re perfect for this top, vertical space. Good luck John. Send us pics when you get this as you like it. Thank you for the quick response. I now have the permission from my employer to go ahead with this project. I will take your advice and not waste the space at the bottom. I am now thinking of maybe having a one inch pvc pipe ( the type used by electricians ) fitted on the side at the very bottom sticking out about an inch. I will take some photos of the area and the start of the project and keep you updated. Please also let me know how i can post the pics here, alternatively i coulde mail them to you to publish ? Joe hi u can also use pallets for storing tools and for fencing.I’m making a one for tools but have one to keep my dogs from areas off limits.Enjoy u on create Tpbs Houston keep the good work up God Bless. Hi Vanesssa. You should consider using some of those water holding additives you can usually buy where ever container gardening supplies are sold. I can’t think of a product name (maybe “Water Grabber”?) at the moment but they used to be pretty common. You typically add a small amount to the soil and mix it in. It will absorb a lot of water and make it available as needed. Tests I’ve seen on these products shows that it does help. Pearlite (the little white spheres inside potting soil) is great for holding moisture, and can be bought by the bag at most home improvement and gardening stores. Hydroton (expanded fired clay balls) also hold moisture really well, but are more expensive. Usually hydroponic stores carry it. I really like the pallet idea! Joe, that stuff inside of baby diapers (when it is still clean – LOL!) is the same as the perlite stuff and free if you have diapers at home. I mix it into hanging potted plant soils so they don’t dry out so fast here in the Oklahoma wind. Free, anyway!!! I saw a video where they mixed the cotton lining from disposable diapers into the soil to hold moisture! Small plastic bags at the bottom of the soil help retain moisture. so far , broccoli, lettuce, spinach and kale , plus lots of herbs . growing really well. That sounds awesome Shaun! Do you have pics you can send? Not sure you can do that on the blog but you can by emailing them to info@ggwtv.com. It would be great to see these. I can post an update to the blog and include the pics there. This is a use of pallets I have not heard before and I’m very intrigued. Thanks for sharing this. My husband just built me a raised garden (about 4 feet off of the ground). He used a piece of ply wood for the bottom. Is this suitable? If I understand your question, the bottom of the bed is a piece of plywood. At 4 feet tall, there’s certainly no risk of not giving your plant’s roots enough room to grow. The biggest issue is that the water is able to drain out. While 4 feet is a very deep bed, unless the water has a place to go, it will build up in the soil while saturating and eventually drowning the roots. If you find this is becoming a problem and there’s no way to get holes in the bottom at this point, then the next best thing is to drill large holes in the side of the bed near the bottom. So my husband and I palnted a raised bed pallet garden this weekend, and neither of us no much about gardening, but we used plastic sheeting to put our soil in…and are just now worrying about drainaige….what should we do, i cant seem to find any answers online! I would poke many holes into the bottom of the pallet and along the lower portions. Just do what you need to give the water a place to exit, while not making it so big that you lose the soil too. That’s not likely to happy (at least eventually) as roots will fill in to hold much of that in place. Could you suggest anything to protect the wood so it will last longer–something that would not harm the plants. Hi Joy. Without knowing what kind of wood you have for your pallets, the most generic think I can suggest is to use a water based wood sealer. However, if you pallet is made from hardwood or even heat treated, that will slow down the degradation process naturally. You could also paint it with an exterior paint. Anything to seal the wood will be an improvement over the raw wood. I am interested in creating many projects with pallets. My husband is concerned that the outdoor projects won’t last and we will have to rebuild them. What king of wood protection do you use. I’d be interested in other opinions as well from those who make pallet projects. Thank. Look for HT (Heat Treated) pallets made from hardwood. They are incredibly durable, even without treating. Many pallets are made from this anyway because of their strength and durability. Stay away from pine and other softwood pallets as they are not as durable. And how do you know if it is pressure treated? Would it work to plant from seed in the pallet? Or would it be better to use a actual plants?? It’s a great idea Danelle if you can allow the seeds to germinate and establish while the pallet is still flat on the ground. Then mount it or raise it to the vertical position once the seeds are sprouted and well on their way. You would need to give the young seedlings time to establish a big enough root network in order to hold the soil together when you raise it up. Otherwise I see a big mess and many of your seedlings falling out or being damaged. Part of the appeal of stuffing existing plants with good root mass is the volume of the root ball is bulky, can handle some “stuffing” between the slats and will stay in. I’d love to get feedback from you if you choose to try this and then share your results with us. I planted basil seeds and they did well. Cumbers are climbers. I think it might work if you had the pallet at an angle although they would do better in the ground with more soil. We build an angled trellis using hardware mesh for our cucumbers and we have a bumper crop every year. I am doing a project for school based on gardening, and using gardening as a way to reduce stress. Would it be alright if I used this idea of using a pallet as an inexpensive urban garden box? I don’t see why not Jason. Just be sure to heed the warning about which pallets to use. You want HT (Heat Treated) wood, vs. chemically treated ones, marked or branded with an “MB”. What kind of plants work in a pallet garden? I do herbs… basil, rosemary (the bushy kind not the vertical), oregano, thyme… I tried strawberries and they just didn’t have enough soil. If you want flowers, porticola (not sure I spelled that correct) also called Mexican roses are a succulent and so really well with little soil and infrequent watering. also any type of creeping sedum or stepable. you can add weed block fabric or burlap to the bottom if you’d like. Otherwise, once the soil is packed it and the roots fill out, you won’t have a lot of soil loss, but there will be some each time you water. 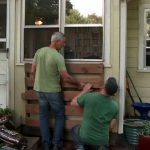 I recently seen the segment with the pallet garden with the house in NC. I was interested in this method. I came to the website to read about it and I am very excited to give it a try this year. Sure hope it turns out well. I like the idea of putting plants vertical to grow. This way will make it easier so that I do not have to plant a big garden but can do a small garden and hopefully get the same results. I will post how it goes when the growing season begins. Thanks for the tips on this method. What do you recommend for winterizing the pallets? or Should I just put in annually plants. I live East of Pennsylvania which gets -20 degrees below. Hi Linda. I would stick with annuals and not worry about trying to over-winter plants if you don’t have them in a protected environment or live where it’s warm. I just love your idea of the pallets garden! I was thinking of even decorating it with lattice as a front facing or even cutting each pallet front with curves. What do you think? Wow Linda. Thanks for the kind words and so glad you love the shows! I think putting your artful touch on the pallet is what makes them unique. As much as I love the raw, pallet look, I’ve seen some beautiful pallets that have been painted to complement the decor of the area around it, such as a peacock blue against a red brick wall. Stunning! But I’ve never seen one that has been embellished with lattice or artful cuts in the wood. Nothing ventured, nothing gained I say. My two thoughts would be this: would the lattice prevent access to the plants, and would the cuts allow too much soil to escape? Anyway, I look forward to hearing back from you if you add a twist to the design. Please do let us know what you do and how it turns out. Thanks Linda. You can put the lattice work on the back of a free standing one and plant that side too. Thinking strawberrys. Do you have any pictures after the plants have grown & have vegetables? I don’t personally have any pictures personally Helicia. But you should try to go to “google images” and type “pallet garden” into the search field. I bet you’ll find lots of images that include well-planted pallets after the plants have matured. Hi, i am ready To try with my first pallet garden in Venezuela. Just have one question, shall i make some holes on the botton of the pallet for the water To drain? Hi Pablo. You could add irrigation holes in the bottom of the pallet. It wouldn’t hurt. I’ve never done this though since there is plenty of ways for water to drain from the bottom of the pallet since there is so much space between the slats. But I would add a lining of burlap or weed cloth (some that will hold the soil but allow drainage). Good luck with it. I love this idea as a free standing screen (or 2 or3). Also if you are concerned about cost of plants, lettuce, spinach and other greens are easy to start from seed and grow quickly. Many lettuce varieties are beautiful! Awesome Shania. So glad you found our information helpful. Good luck and thanks for letting us know! It’s a great idea for the folks who are short on space, thanks for sharing with us. Hi! I made 3 of these for strawberries and the late spring. I live in Nor Cal, with the drought. However, I am having a hard time watering. Each time I watered, soil fell out. I packed it pretty good with soil before adding the strawberry plants, but I kept losing dirt. Since i couldnt water, i lost 3 full pallets of plants. Any ideas on how to keep the dirt IN? Help! Hi Becky. Some people insert landscape fabric, aka weed cloth into the pallet and/or staple it to the bottom and sides where they can. This will def. help. Hello. I took your ideas and made my garden this year out of pallets. Looking back even now I realized I didn’t put plywood on back. I just used black roll and placed it on another pallet . Another one I stood up and realized my plants shifted and standing it up at a a 13 degree angle was best. The dirt shifted again and lots of it in the pallet . It is only full on on side of the pallet. That’s ok because I’ll grow some more lettuce and radishes before our fall sets in in the Yukon. I also had a shelf from coca cola that I turned sideways and made containers out of my bags of dirt. I have 3 bags of carrots growing but I need more sunshine. It’s not been a good year for it where I live. Even my upside down tomatoes are having a hard time. They may need to finish growing inside. Strawberries in my buckets are good and lots of water needed for fruit. Fuchsias love it and so do the root veggies. Take care. I have pics on my FB. So glad I committed the time for this project. I am opening up a juicery and planning on putting in a wall garden. I just stumbled across your site and loved this post! I am going to construct this next week and live in Carlsbad CA and am completely new to gardening but would LOVE your thoughts on what to plant in this pallet wall garden? What have you had success with growing in these? Thanks so much! We’ve had great success with trailing edibles like cucumbers, squash and melons (all compact or container varieties) on the bottom row, lots of herbs, lettuces, spinach, and chard in the middle rows, and dwarf / compact tomatoes and peppers in the very top. Keep in mind you’ll still have to stake or support the tall plants but it allows you to have a very diverse garden in a compact space. And don’t forget to disperse lots of flowers (we like edible nasturtiums). It’s a stunning combination! I am willing to try this method of gardening since I am unable to stay in a bent position. I like the idea of putting wheels on the pallets to be able to move them around in the small yard. This project is great for those with disabilities. Haven’t tried yet, but it looks very good in design. Since I’m unable to stay bent over for along time I am willing to try this project. My question is, can I paint the pallet? I think it’d be cute in a bright color!! If so, what type of paint would be paint safe? Hi Julie. Painted pallets look fantastic! I have seen many and they look incredible–and a great way to accent or contrast a background color. The pallet really pops when it’s painted. I would use a water-base latex paint. It’s easy to work with and should do just fine. You might want to put a coat of primer on it first. Good luck. I have a palette with a completely open back (No slats on one side). I noticed the upright freestanding one has a solid plywood backing with what appears to be burlap in between. Would I need to put down garden fabric in between the palette and the solid backing I plan to use, or is it redundant? Also, would you not recommend a solid backing? I’m concerned about water and air circulation. You don’t need to use both a solid backing and the fabric. The solid backing is necessary mostly if you are mounting on a wall to provide protection. Otherwise, the fabric should be sufficient to hold in the soil IF you have some support on the back side, like other slats, even if they are spaced farther apart. But you’re saying you don’t have those? If not, consider adding something to give more support to the back side or go with a solid back. When the soil is wet, it can create a lot of pressure and weight to push again just fabric tacked into the out frame. I wouldn’t worry as much about the air circulation. As long as the foliage is getting air, and the water has a place to drain, you should be fine. My family member owns East Pointe Fiberglass and she has some pallets we can have. Would they be safe to grow vegetables? I was concerned due to Fiberglass being made with formeldhyde and other harmful chemicals? Could we use them just for flower garden only? 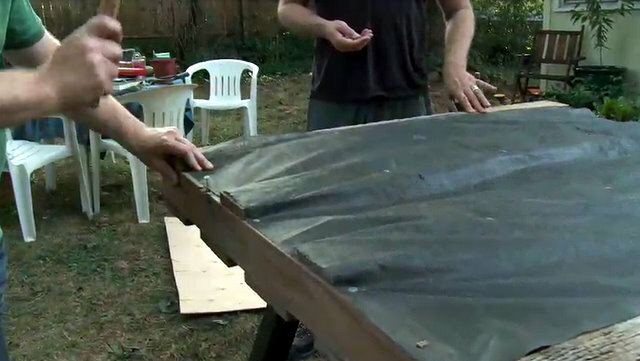 I had enough funds to get staples and seeds I am doing a few veggies in mine but I had 2 light weight tarps given to me and used it to wrap it to hold dirt I plan on leaving it lay down, but my main question is do I need some holes since I am using the tarp instead of the special fabric? I think this would be a fantastic idea for growing strawberries! Do you think a chicken coop wall could support the weight of the pallets? Our chicken coop was converted from a 10′ x 12′ garden shed. I think so, especially if you mount the pallet into the 2×4 studs of the shed. Try and locate those and secure the pallet into the studs and you should be fine. I just wanted to know what plants you think are best suited for a vertical pallet garden? Thank you. It’s really up to you Hedy. Part of the fun and beauty is the uniqueness and personal design of the pallet gardener. I grow a lot of edibles so I would use plenty of leafy crops like lettuces and edible flowers. Herbs are great also. Unless your pallet gets 8 hours of sun, growing fruiting veggies might be a challenge. However, you can grow varieties specially bred for containers such as Patio tomatoes and bush cucumbers. Places trailing / vining crops like the cukes at the bottom and tall upright plants like tomatoes and peppers in the top section. Fill the middle sections with leafy greens and herbs. I was thinking of running either inline emitters on each planting row at a 5 inch or so spacing, or slit drip hose, or drip soaker hose on each planting opening. Then I use standard Hose quick disconnects to interconnect it to my drip “Infrastructure” so that I can disconnect it and move it whenever I need to like after the season for storage…….. Watering by hand has it’s challenges with a drought. Do you think this idea has merit? Grog, if you can get get drip emitters to where you need them or use soaker hoses, that’s always a great idea in my book, especially were you live. However, I would not slit drip hose. Use either soaker hoses or stick with the drip lines and emitters made for them to delver the water right where you need it. This is awesome. I have a small back yard(very small). This will be great to get some fresh veggies for once. I like this idea but was wondering if a person could attach it to a chain link fence instead? My back yard is fenced in, in chain link. Yes you can Susan. But be sure you have it mounted securely enough to support the weight when the pallet is lush and the soil is moist. That can add a lot of weight. I have a lot of very old & very heavy pallets where I work. They have been inside & have not been used in probably 20 years or more. Do you think these would be safe to use? Being that old I’m thinking they may not be pressure treated or doused with tons of chemicals. Also what are some ideal plants to use for this? More than likely you should be ok considering the age of these pallets. As for plants, if you’re using edibles, place trailing or vining plants at the bottom and look for dwarf varieties. In the middle section, herbs and lettuces work great. At the top, you could plant dwarf or patio varieties of tomato, peppers or eggplant. You’ll need to stake them but be sure to get varieties that stay on the smaller size. Otherwise they can grow far too tall to manage in a pallet, especially tomatoes. Caught the tail end of one of the TV show the other day and had to check it out online. Great Stuff!! I will be using the pallet idea with our gardeners. If they prop one up at the end of their allotment space it will give them an extra 4 feet of space – FREE!!! So glad I tuned in! Thanks Joe! You’re welcome Sher. 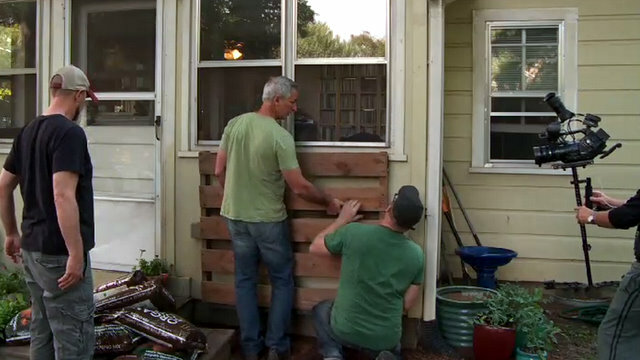 The pallet idea is such an easy way to expand garden space cheaply, especially vertically. Happy you found this to share with your fellow gardeners. Hi Joe, Great idea — I’m curious about the weight of your pallet because I’d like to place some on a rooftop. Using the same size pallet and amount and types of plants you used in the demo, do you have an estimate as to how much it weighed with and without water? Hi Laura. They weren’t that heavy, I’d guess about 160 pounds at the most once planted with a lightweight potting soil. My guess is the pallet weights about 35 pounds, 6 bags of dry soil at 20 pounds each and the plants weigh next to nothing. For each gallon of water that’s absorbed into the soil when watering will add another 8 pounds. It’s a total guess but those are the components of it so I don’t think I’m far off. I HAVE A VERY SMALL PATIO-NO GARDEN SPACE AT ALL. THANK YOU FOR THE IDEA, NOW I CAN GO HERBS. Any ideas of how to create one that grows off of both sides? I want to use it on my deck rail so you can see the plants from outside the deck but also grow and pick things from the deck side as well. How could we do this without the soil falling out? you could definitely add extra slats to the back side to mirror the front side and then plant on both. I did that for the compost bins I made out of pallets. Didn’t want the soil to fall through the cracks on the wide side so I closed the gaps with extra wood. Super easy to do and worked like a charm. It’s an easy fix. This may be rare but I received a wood box from Japan that had a type of termite nest in the wood boards. Heat could kill them safely. Read your update about adding triangle feet. Some ideas I had about it. • Screen to hide stuff behind! Be it trash cans, wheel barrel or a bicycle. • How about planting it on both sides? Might need to put 2 together back to back. Love the idea about using the pallet garden as a way to screen unsightly things behind it. We all have those places, and what a great way to hide them. Perhaps even a base with wheels to easily move the pallet when needed? I found a goldmine of wonderful “virgin” pallets at a sheet metal roofing company. They routinely receive 12 ft. long sheets of metal on beautiful 12-ft. long, very HEAVY duty pallets that are usually made of oak, perfectly clean, and NEW with NO signs whatsoever of any chemicals. I even found some made of white oak!! How cool is that?? Some are 5 ft. wide! These are big and heavy and the company is glad to have me take them away. I bring my generator and corded saw to cut them to size. Any scraps are PERFECT for the fireplace. Can you say Win-Win..?? Wayne, that IS a goldmine! You are a very lucky man. What a great find. And good luck keeping your special place a secret too. I had a similar situation in the town I used to live. They had a pallet making company, so all the wood was virgin, untreated and super clean. The pallets were all uniform in size and they even offered extra slats that you could fill in the gaps if you wanted to close in the spacing (which I did). Great pallet sources are out there if you just take the time to look around and do your homework. No need (no should you) settle on treated, nasty pallets from who knows where. Great comment and thanks for sharing. I’m just curious, roughly how many plants were used for this pallet garden? I’m trying to get an estimate of how many to buy to do my own. i realize it would depend on the kind of plants used, but a rough estimate would still be helpful for me. Thanks! Hmmm Nancy. I had several flats of 4 inch pots. Assuming each had about 16-20 plants per flat, I might have used about 60 because we really packed them in. The finished product looked nice right off the bat, but over time, less plants filled in would give a similar look. I wish I could give you a more accurage number but I know we had a lot of plants to use so we stuffed them pretty generously. If I were to do it again, assuming each planting slot between boards is 4 feet wide and you have the top, and 3 slots beneath it, that’s 4 rows of planting. If you space each plant 6 inches apart that’s only 8 plants per row or 32 plants total. But, to get a fully planted look, you’d want to pack them in more closely. That’s why I’d go for at least 10 plants per row or 40 + total. Hope that helps. Hi Joe, I’m looking to make a pallet garden for a rooftop but I’m concerned about the weight, how much does a typical pallet garden weigh with the seeds/plants and potting mixture in? I’m looking at a pallet that is roughly 4×6 feet. Hi, kindly re- read threads above. Your question was already addressed. See November 5, 2013 answer to Laura. 😉 enjoy your new garden! I have a question that I hope someone can answer…is it ok to paint a pallet that you are going to plant herbs in? In the square foot gardening method, they suggest to Only paint the outside, Never the inside, if you must paint. Particularly if you are growing edibles vs. for fun and aesthetics. Just fix a post on either side of the pallet and dig a couple holes to hold the posts. This will keep the vertical garden a few feet off the ground. Try planting Marigolds. They’re known to repel little peter cotton tails that like to sneak into gardens 🙂 I think they don’t like the smell or maybe they just taste terrible! Good luck! I live in Tucson,Az. Out here Marigolds r useless, they r eaten by the rabbits. Just to let u know . Just a thought to keep in mind. What ever you descide on, read through an extensive list of what not to give your rabbit to ensure you do not plant anything poisonous or something that will give them diarrhea. Let us know what you decided on. Quite interested as we will be having bunnies in the garden too. Am glad I found this website on growing veg with pallets. I think I am right, but can’t I just put the landscaping material on the pallet, fill with good soil and lay them flat on the ground? I have no place to hang them on my house. By laying them on the gound, the veggies would also be getting moisture from the ground. I am just looking for a way that my husband does not have to til up the ground….I would never get my garden if I waited on him to do this 🙂 So, I just go ahead and plant my tomatoes and bush beans between the slates? I don’t see why not Donna. I know people that cut a slit in the bag of soil and plant directly into it, so I don’t see why a pallet is much different. My main concern would be the root depth for tomatoes limited by the shallowness of the pallet width. But you should try it and see. I think the plants will adapt just fine. Also, if you don’t want to hang the pallet but would like a vertical option, you could simply add some 2×4′ to the bottom and create feet so it can stand freely without mounting. That could give you a lot more options and the roots would be able to grow more deeply as an added benefit. You could always use two mirrored pallets to add height and backing at the same time. Then read the square foot garden method so you can get a good start on your new garden. Enjoy Donna! i would NOT want this MESS against my house! and it wouldn’t get the sunshine & air it needs. but it makes sense that it would be warmer for growing plants if it was IN THE GARDEN like a raised bed. put pallets together forming an L or a U shape. line them with burlap, fill them with soil and then CUT SLITS in it where you place the plants. Hi Susan. I don’t know of a national site to buy them but someone should do that. I just wonder what the shipping cost would be to ship a shipping pallet!? Ha. I was lucky b/c there was a place in my town that did make them. Anyway, I think you could fabricate you own pallets easily with non-treated, weather resistant wood like cedar by purchasing the supplies at your box store. In fact, if you really got creative, you could go to town with this idea. Add a stand, a waterproof fabric for the back, etc. Anyway, you could make a kit for yourself or others. But my vote is to make your own. It should be so easy and inexpensive. You can find free and cheap pallets on Craigslist. I can hardly wait to try this pallet idea! I want to put my pallet on wheels to roll with the sun! I will also be planting on both sides of the pallet. I will use low growing, shade loving, flowering plants in between a variety of lettuce on one side.The other side will be sun loving plants. This will require more watering, however with such little space it will be worth it! Brilliant idea JoAnna! I’ve never seen a pallet on wheels before but it certainly makes sense. Please send pictures if you do this. Thank you for sharing your idea here. Can’t wait to see it in action. You have me wondering about drainage if placed on a wooden deck. No one mentions a catch pan to save ruining the deck. In the upright version, I also wonder about the amount of water making it to the lower opening. (a problem I had with a tall strawberry pot). Would plastic tubes carrying water half way down to release help the plants on the lower level? I love the look of all these reused pallet ideas but am very leery of doing them. I work for a company that imports products from China, etc and our containers get fumigated, pallets and all, often. So even if the pallet is not pressure treated lumber, how would you know it hadn’t been treated with chemicals at other times of its life? Love the idea of the vertical garden, but i’m concerned about the damage to the house–constant moisture against the siding, etc. This could be a free-standing vertical garden placed on 2×4’s inserted in the ground to give some breathing room. Agreed Nina. 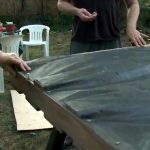 There are many options here, from attaching a sheet of plastic as a waterproof barrier against the pallet before securing to the house, or as you said, making it freestanding. I think that’s a great idea! In hindsight, I should have included this step in my instructions! Thanks for your comment. Hi. Nice work! I will try do make one too, tu put in my friend´s home exterior. I am just waiting to notice the sun period, to choose for the plants. I agree. But one can take some steps to know your pallet’s pedigree. Here in the South, we have many pallet companies where they are made from freshly harvested pine or hardwood. And the majority are untreated. I would be comfortable taking this route. Might cost a few bucks but all those other concerns would be nipped in the bud. Are there any issues having that moist soil against the house siding? In terms of mold or encouraging insects? Hi Phil. To play it safe, I’d attach some thick plastic sheeting or other waterproof barrier on the backside. It’s cheap, easy and an effective fix. Thanks Joe, I think that’s a good idea. If the pallet IS pressure treated, couldn’t on line the whole thing with sheeting to prevent chemicals from leaching into the soil? Yes you could. The goal is to prevent roots from coming in contact with any part of the wood or what leaches from it. A think layer of plastic is the suggested method to prevent this. If you do this Peggy, will you take pics and keep us posted on how this goes. I see some logistical challenges but totally doable. Would love to track your progress and hear your comments. Thanks! What kind of edibles work the best in a pallet garden? 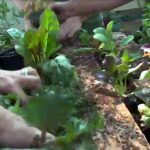 For a pallet garden, almost any herb would work and are best suited for this type of garden since most plants stay relatively small compared to vegetable plants. Edible flowers are also a great choice. Nasturtiums would make an excellent choice and add fantastic color. For vegetables, I would place taller growing plants like peppers and bush beans along the top row, and trailing or vining plants (especially smaller growing varieties of bush cucumbers and tomatoes) along the bottom row. Cherry tomatoes also work well. If you want to plant other veggies in the pallet, I would focus on dwarf, patio or bush varieties, all bred for smaller spaces and growing environments. Hi, I have a question. Everyone says that palletts are pressure treated and that you shouldnt grow veggies or edibles in them. What do you think? Hi Elaine. Not every pallet is made of pressure treated wood, but if it is, I would avoid it for growing edibles. However, many are non-treated or made of weather resistant wood, such as cedar. Those would be fine for planting edibles. Suzie….look for pallets are marked “HT”. These have been “heat treated” and not with pesticides. You can actually find this information online as well if you care to read more. Happy Gardening! Great tip Sherry! Thank you!! See this link it shows markings for Heat Treated Wood.